This interesting recipe was submitted by a reader of the website who has their own website called Casa de Retalhos. Regina is a Brazillian who has been living in America for over 18 years. Her blog is written in Portuguese, but when she does recipes she also writes them in English as well. Her site is very interesting with recipes, gardening info and some great images. 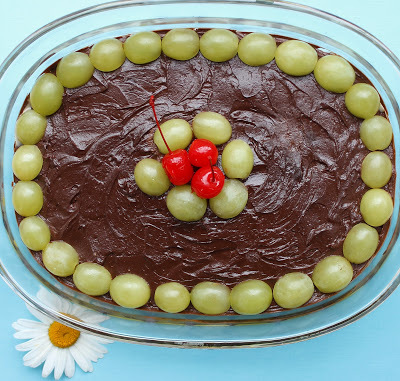 This recipe is a chocolate coconut dessert recipe which uses grapes for a refreshing topping and looks delicious. Very festive looking too. Might be something different to add to your Thanksgiving buffet table this year. Thanks for sharing Regina. Be sure to visit her website Casa de Retalhos for more interesting desserts. Chocolate Coconut Recipe with Grape Topping. Tart grapes are the perfect topping for this rich and sweet chocolate coconut base. Mix the condensed milk, butter and coconut in a medium saucepan over low heat stirring constantly. When the mixture starts to thicken, remove it from heat and pour it into a serving dish. When this mixture cools off place the grapes gently over the top. For the ganache. combine the chocolate and heavy cream in a small saucepan over low heat, stirring until the mixture is smooth and creamy. Let it cool slightly, then use a spatula to pour it very gently over the grapes. Refrigerate for a couple of hours before enjoying this easy and delicious dessert.